On your next trip to Paris why scale the heights of the Eiffel Tower when you could be exploring the depths of the city’s catacombs? 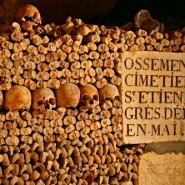 For a tourist destination on the dark side, walk the skull-lined corridors getting up close and personal with more than six million past Parisians. I love Paris. Sorry, j’adore Paris. Although, I didn’t love it on my first trip and thought it looked a lot like the London I grew up in. (Yes, I can almost hear the collective gasp around the world as I compare the City of Lights to London – but they do share the shame overcast weather you know!) 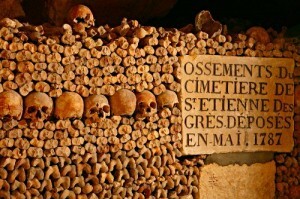 On one of my first trips to Paris I discovered the Paris Catacombs and have been back twice since. 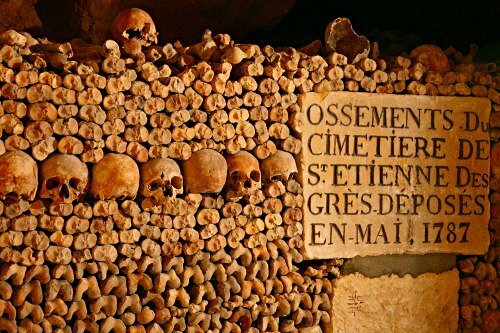 Housed in the hollowed-out galleries of the subterranean limestone quarries once used to construct Paris, the catacombs were created in 1785, when local residents began complaining about the putrefaction caused by charnel houses overflowing with corpses. While the sight of human remains scattered about the cemetery was tolerated, it was when milk went sour and wine turned to vinegar because of the decomposing bodies’ foul vapours, that the decision was made to transfer the Cemetery of the Innocents from the city centre to an official, permanent ossuary on the outskirts of town. With ceremonial procedure, skeletons transferred in barrows at dusk were used to build an underground wall of large bones lined with anonymous skulls for decorative effect. Behind this rampart the rest of the bones were haphazardly thrown into a void reaching up to 30 meters back. A tourist attraction with European royalty since the onset of the 18th century, today a two-km tour takes visitors 20 meters below Paris streets into the musty macabre maze. Visitors are encouraged to take photos, although tripods are forbidden. Be prepared to have your bags checked upon exiting to show that you are not souveniring any skulls and count yourself lucky when you make it out safely. Before electricity was installed a continuous black line (still visible) enabled visitors looking for a spine-chilling experience to find their way through the underground maze but that didn’t help poor Philippe Aspairt when, in 1793, he decided to go down into the catacombs alone. He got lost and workmen found his skeleton 11 years later in 1804. Where: Les Catacombes de Paris entrance is easily accessible by Metro. Near Notre Dame, the address is 1, place Denfert-Rochereau, 75014, Paris. 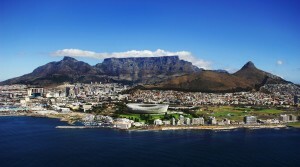 When: Open daily except Mondays and public holidays. To do or not to do? There is no question! :Death is not everyone’s thing. I appreciate that. But if like me you see it as another factor of life to be experienced then one of my favourite places to go for a wander has been a cemetery. No one around the world seems to be the same. Reading the tombstones, trying to imagines people’s lives, getting a greater appreciation of exactly how short life is. Where have you been recently that helped put the fragility and brevity of life in perspective?